The Royal Commission into Banking. My lord! But rather than opine over the content, we are interested in the potential impact. Several months ago our economist Tim Toohey estimated the impact on consumer spending when interest only loans switched to principle and interest. We were pleased to see Deputy Governor Chris Kent come out with very similar estimates, directly rebuking some of the more alarming estimates in the market place. But the Royal Commission has chastised banks for not verifying expenses on home loan applications. There has already been a broad switch by the banks to incorporating more realistic expense assumptions over the last couple of years. So the housing market has already weathered this and similar impacts since 2014. It is too early to say whether the Royal Commission will lead to a material tightening in credit availability, but some tightening is to be expected. “Some” the housing market can cope with, as we have witnessed over the last 4 years. “Material” would be a problem. It does have the potential to delay an RBA hike this year, and at this stage we would not argue emphatically one way or the other. The broad Australian economy is performing very well and will get a boost from tax cuts this month. 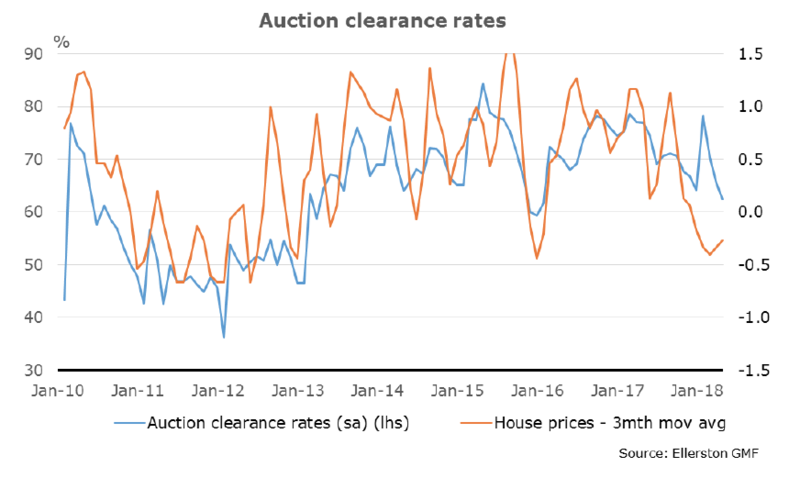 We have a very real time indicator of housing- the weekly clearance rate for house auctions. We will watch this closely and continue to liaise with the banks and mortgage brokers for an early indication of more restrictive lending. The prospect of an RBA rate hike in either November or February next year is very fluid. If clearance rates stabilise at 65 or higher, the RBA will commence hiking. If not, they wait. They won’t cut.